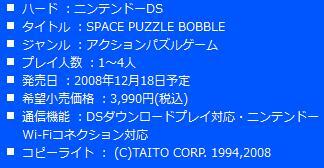 As you can see, the official Japanese website for Space Puzzle Bobble lists the game for a December 18th, 2008 release. No word on whether or not Square-Enix will localize this game for audiences outside of Japan. If you really want the title, it should be pretty import-friendly. Better yet, you can check out the flash demo. Click here to try for yourself!